It’s not very often I stumble on a recipe (actually Mrs. G stumbled on this one), try it out and immediately think to myself, “I’ve got to share this one with my readers.” See, the thing is we are not real good at following recipes. We’ll use it as a broad outline, maybe change a few things to better suit our tastes or use what we have on hand. Such was not the case when we made this soup last week. 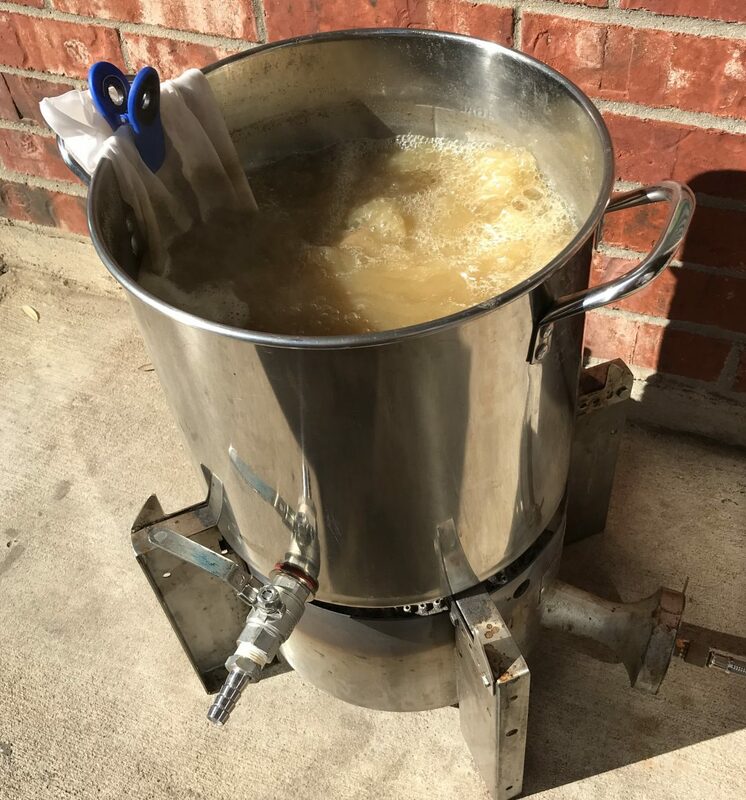 We followed this recipe to the “T”. Ok…we almost did. The ingredients are exactly the same, but we changed the process just a hair. Now, before we go any further, I’ve got to give credit where credit is due. 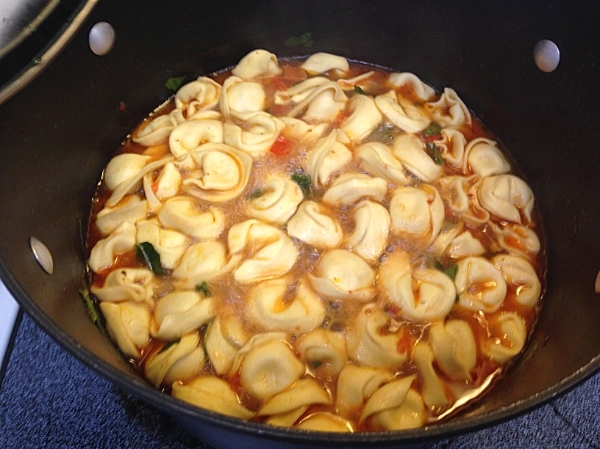 This Italian Sausage Tortellini Soup came from Maria and Josh over at Two Peas and Their Pod. I sent them an e-mail and they graciously allowed me to share this soup with you guys. I haven’t checked out their whole site, but they’ve got quite a few things I can’t wait to try out myself. 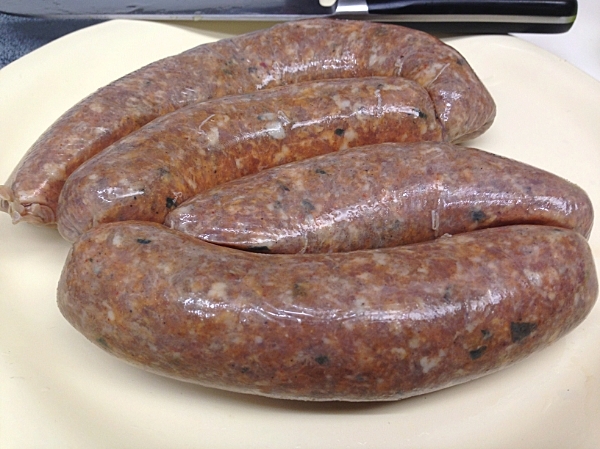 The first and only change we made to their ingredients was to use Hot Italian Sausage. Normally, when I see Italian Sausage in a recipe, I figure they mean regular. Hot usually works as well and it just so happened we had one last pound of it in our freezer. I think that’s how Mrs. G found this recipe. She was looking for something to do with it. Anyway, I cut the casings off the sausage and rolled it up into little meatballs and browned it off in a skillet. The second change I made was to take a little bit of chicken stock and de-glaze the skillet. I figured why let all those good bits go to waste? The de-glazed skillet was set aside until it was time to add the remainder of the broth to the veggies. In their third and final step, they immediately added in the kale and the tortellini, cooked it for 7-8 minutes, then added in the fresh basil and sausage meatballs. That works for them and would make a quick weeknight meal. I don’t know about you, but I like to let my soups simmer for as long as possible. Let those flavors really develop. So after their step two, I added in the broth (including the “good bits” from the de-glazed skillet), the tomatoes and the sausage meatballs and let it simmer…and simmer…and simmer some more. Probably for two hours while I was waiting for Mrs. G to get home. Once Mrs. G got home and was ready to eat, we added in the kale and tortellini and allowed it to cook for about 7-8 minutes, then added in the fresh basil and let it cook for a few more minutes. Final taste, adjusted any seasonings needed (we didn’t need to) and serve it up. This soup was just screaming for a little bit fo freshly grated Parmesan cheese on top. 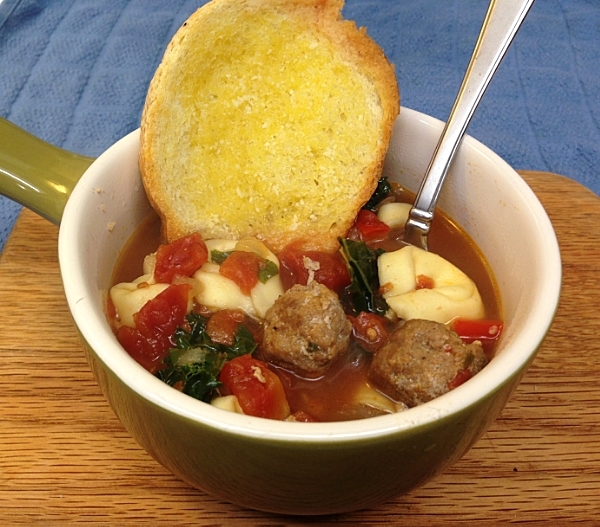 Maria said in her post that this”…Italian Sausage Tortellini Soup is hearty, full of flavor, and easy to make” and boy is she right!! It packs in a bunch of flavors. 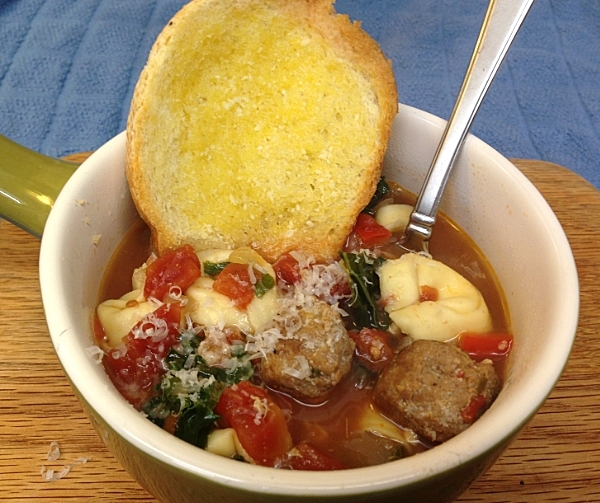 Hearty, spicy Italian sausage, tortellini filled with cheese, kale, red peppers and fresh basil! It was so good I went back for seconds and kept telling Mrs. G throughout dinner that I was going to have to share it with our readers. I think our version probably was spicier than hers due to using Hot Italian Sausage, but it wasn’t overpowering. Use either one depending on how your tastes run, but definitely try it soon. I know you will be impressed. I can see us making it quite a few more times as the weather begins to get cooler and we enter the winter months. Oh this looks really good. Perfect for the cold weather we’re starting to have. Can you hear my sigh of contentment from over there? It looks and sounds delicious. And, I am so, so jealous of your home made Italian sausage. Ok, if you’re gonna continue to put up pics like this with your recipes, you gotta start handing out drool bibs! It is 30 degrees below zero here (ok, it FEELS like it) so this soup would be welcomed here right now. This was so good. The only changes I made was to use Italian Turkey Sausage and do it in my little slow cooker because I can’t stand up. I cooked everything for one hour on high then added the zucchini and tortellini. It turned out very good. It tasted great on a very cold night.